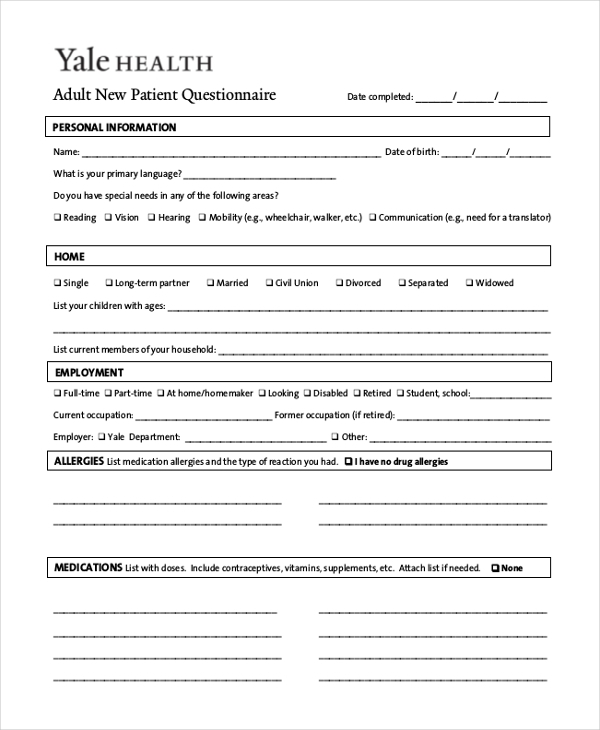 Health originations often provide questionnaire forms to the patients to furnish relevant information about their health and habits. This makes it convenient for them to start the treatment, sometimes, these forms are provided during an ongoing process of treatment. The purpose is to reveal certain information about the traits of the patients. 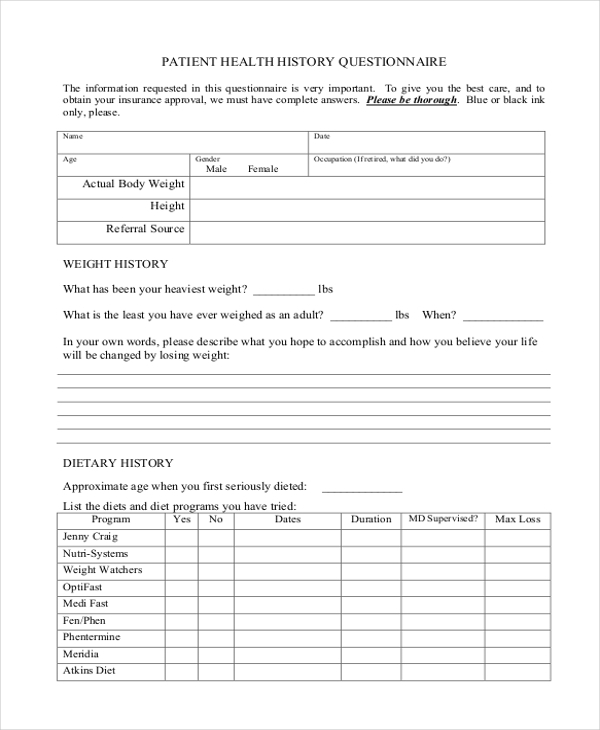 Here are some Questionnaire Forms and you can check out the details and format. These documents contain some initial information, followed by an in-depth inquiry about the thoughts and habits of the patient. The questions are answered by the patients by marking a certain circle placed beside the questions. 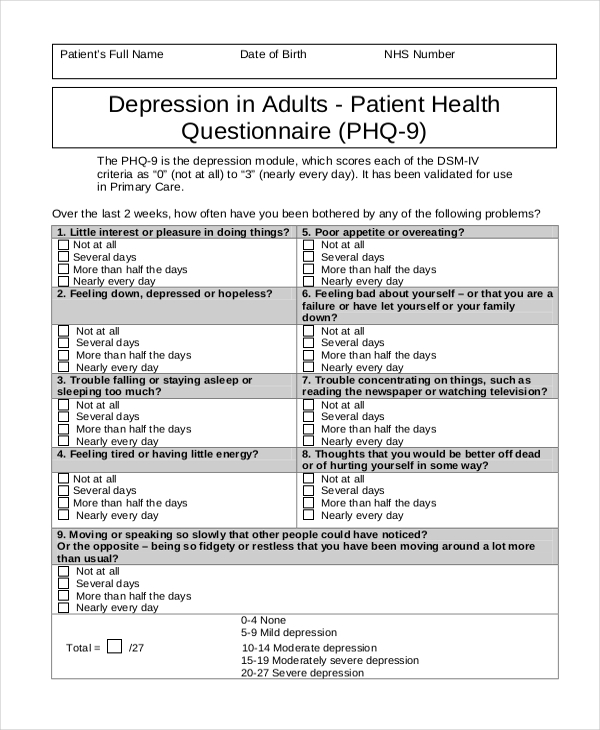 This template contains questions that are personalised for a patient suffering from stress and depression. The questions are placed in separate sections and there are answers to be chosen for each of thee. 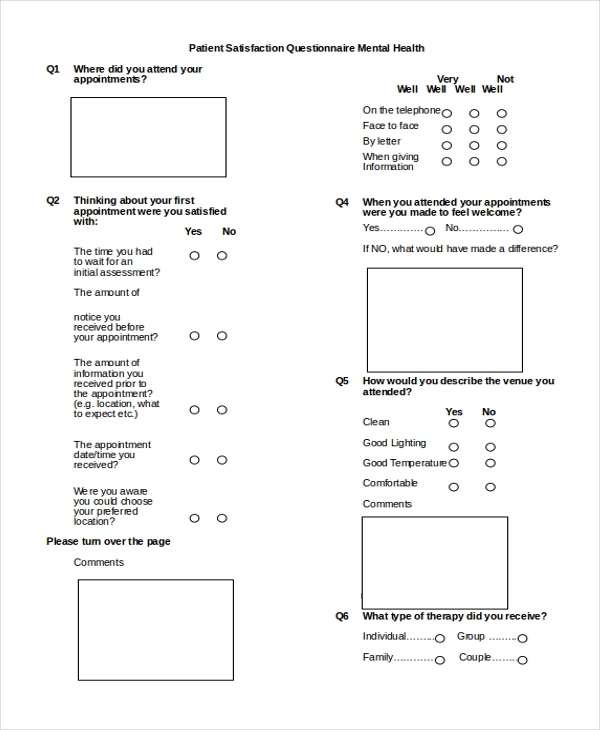 You may also see Patient Satisfaction Questionnaire Forms. This template can be used generically. The patient history, allergies and other information are presented in different sections. 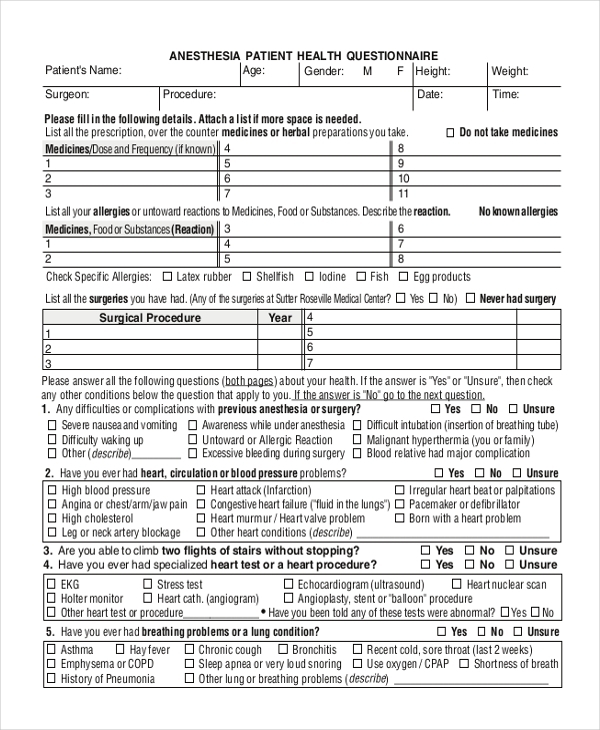 These make it easy for the doctors to know about their symptoms and problems. The detailed history about a patient has to be furnished in this document. Different questions are to be answered and tabular formats are presented to be filled up in this template. You can also see Food Frequency Questionnaire Forms. Here, the personal details, address, employment, allergies and medical information are furnished in different sections. These forms are used to get a comprehensive knowledge about the health of a person. Various questions are framed and presented in this questionnaire. The form contains space for answers to be written beside the questions. You may also see Secret Santa Questionnaire Forms. 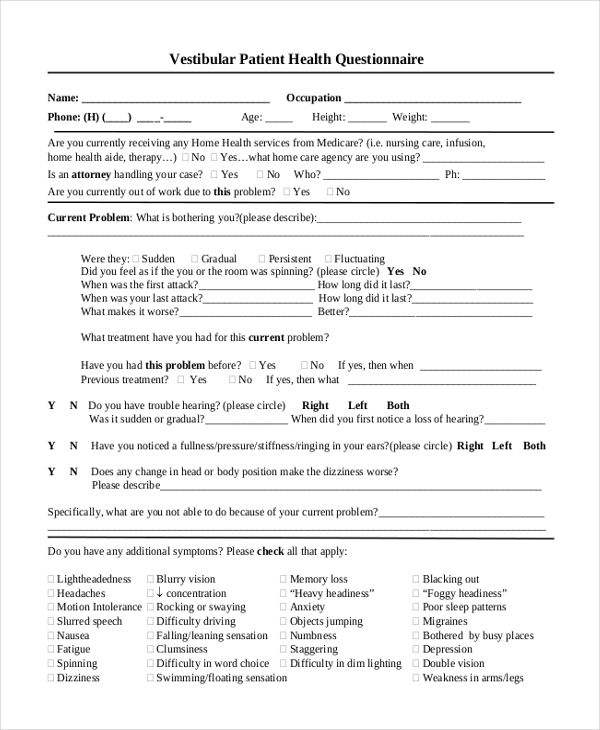 This form contains questions that are personalised for a patient suffering from vestibular problems. It is a detailed questionnaire, with questions seeking information about almost all aspects of the person’s health. It is often found that medial institutions dealing with a particular ailment, suppose depression starts treating a new patient without knowing the previous medical conditions. This may harm the patient. The doctors need to have a comprehensive idea about the medical history of the person to know about his health standard, immunity system and related aspects. 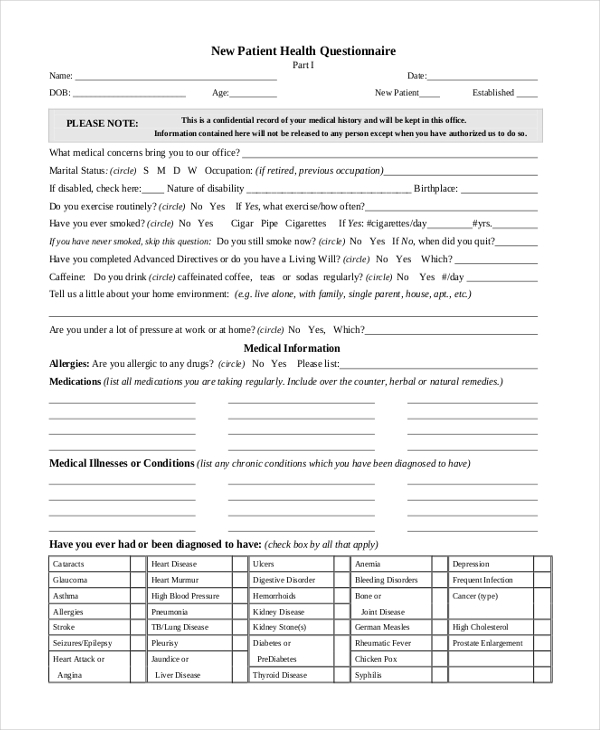 These questionnaires are presented to the new patients and the answers provided by them reveal the overall health conditions and medications of the individuals. You may also see Questionnaire Consent Forms. How are The Questions Framed? The questions are framed to yield relevant information from the patients about their health conditions. They may be open-ended or close ended ones, as per the relevance of the topic. Sometimes the hospital authorities deliberately frame close ended questions to save space where explanations are not needed. In other cases, there are blank areas to be filled up with the information. The questions are framed to get an idea about how the person behaves in certain circumstances, or what his sensations are when he suffers from a certain ailment. The Health Questionnaire Forms are used by different health organisations to check out the problems faced by the patients. You may explore the website for these templates. You may also require Questionnaire Consent Forms or Patient Satisfaction Questionnaire Forms. These are available in the website and you can customise them as and when you need.